From Tracie: Do Baby Teeth Have Roots? Katarina has impacted canine teeth and other dental issues that are going to require braces and oral surgery to be set right. Her orthodontist needs all the baby teeth out of the way to move forward with our treatment plan. We wiggled and wiggled, but all the wiggling in the world was not going to make those teeth come out sooner than they wanted to leave (and a few of them were never going to come out on their own because the adult teeth are not positioned to push them out). After the better part of a year, and only loosing two teeth the "natural" way, her orthodontist recommended having the remaining baby teeth pulled. She had eight baby teeth! We visited a dentist who was willing to extract all eight for us, but there was a lot of crying, and pain with the first tooth. It was the smallest of the teeth that needed to be extracted, a canine tooth, but it came out with a huge root attached. I was surprised, having never seen a baby tooth that hadn't been ready to fall out on its own. I learned a lesson. Baby teeth do have roots. We don't usually see them, because as an adult tooth works its way toward the surface, the root of the baby tooth reabsorbs and disintegrates. This is makes it possible for the baby tooth to wiggle, and come out nearly painlessly and root-free. This was not going to be a simple, painless procedure, and it was quickly decided Katarina was going to need sedation to get the remaining seven teeth pulled. I've never had sedation with any dental procedure (I just breath through the pain and pray for strength, because Novocain doesn't work for me), so I never realized how few dentists do in-office sedation. There is only one practice in our area that offers sedation for children, and we were blessed to be able to get an appointment with them. 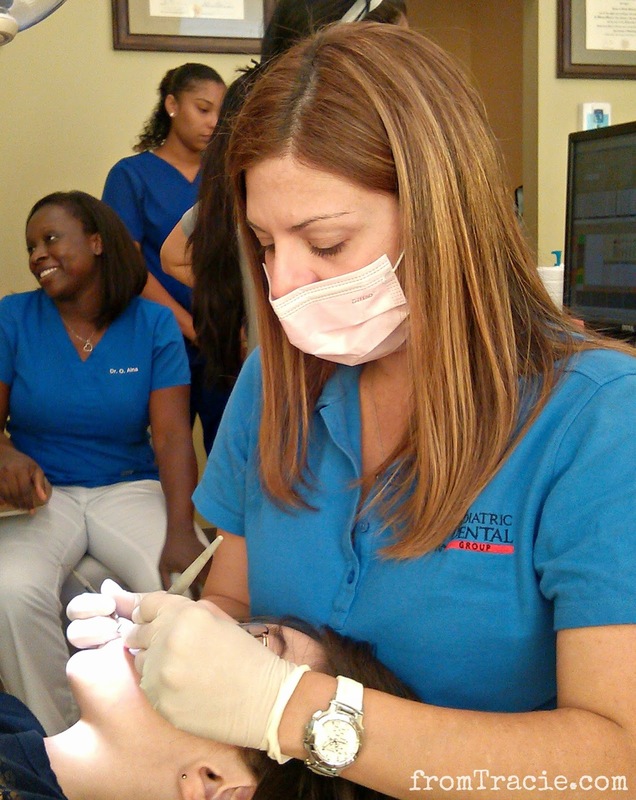 After a consultation visit, Dr. Linnette Hernandez was ready to pull Katarina's baby teeth. Friday was the big day. It was actually a hungry day, because she wasn't allowed to eat anything after 10 o'clock the night before, or drink anything the morning of the procedure. The first step was oral sedation. Katarina was weighed. The doctor mixed the medicine according to her weight, and had her drink it in the waiting room. 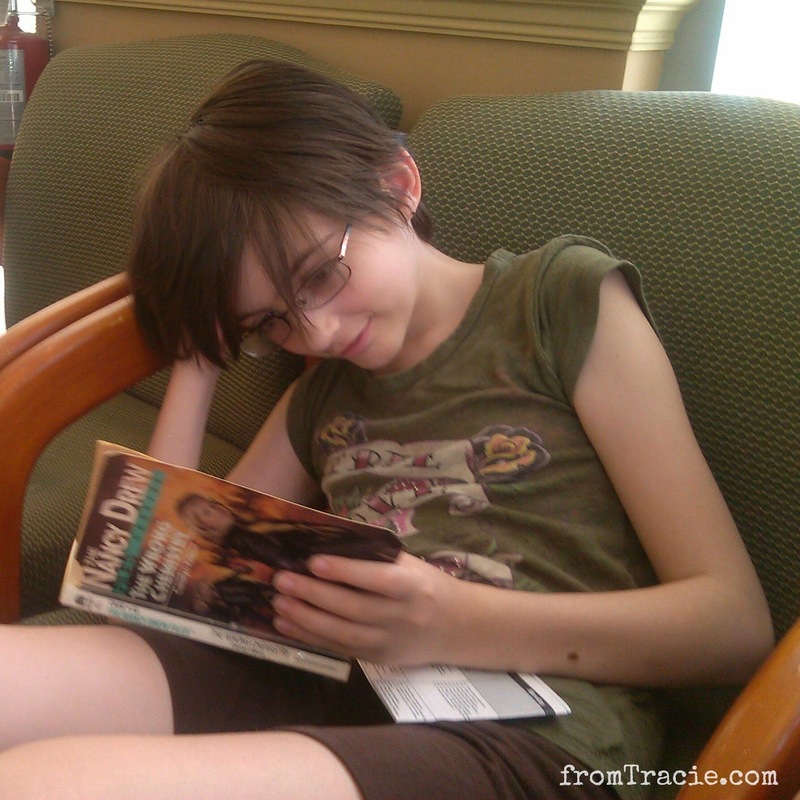 Katarina, ever the reader, was determined to read her Nancy Drew book while the medicine took effect. Even when she started getting a little loopy, and the letters were waving to her. Parents are not allowed in the room when sedation is being used, so after the oral sedation had taken effect, the dental assistant escorted her to the procedure room. She was given Novocain shots and laughing gas before Dr. Hernandez pulled the teeth. Twenty minutes later, she was back in the waiting room with me. I was impressed how quickly they were able to pull her teeth. As you can see, most of these teeth had some pretty impressive roots. Especially the molars. Here they are with quarters to give you an idea of the actual size. Now that the baby teeth are out, we wait. We need the permanent teeth to grow in, the orthodontist to give the go-ahead on surgery and braces, and an oral surgeon to do the actual surgery. Also, we need a lot of soup recipes, because it is hard to eat when you are missing most of your chewing teeth. What an ordeal! Hugs to your little one! I had a baby root canal as a kid and I thought that was pretty bad from my recollection. Your poor girl, but will say she is totally brave and rocks in my book fro going through this. I wishing her a quick recovery and hope those adult teeth come in very quickly and easily now. Oh, your poor baby! My daughter's two bottom teeth had to be pulled because their roots weren't dissolving and her permanent teeth had grown behind them. We teased her and said she looked like a shark! It was not fun for her, and so far her other baby teeth have been falling out the regular way. Oh bless her heart!! Those teeth!!! WOW. I am so so glad you found a dentist who does sedation. No one needs to endure THAT without it! I wish I had some good soup recipes! :( Hoping the adult teeth move in FAST. Poor little thing!! What an ordeal to go through, hope she is feeling better now! Wow! I never knew that teeth falling out naturally had that with the root. I didn't know because I never lost a tooth naturally. Weird, right? Mine would never budge. I got all of them pulled, but not all at once. Eight is a lot!! I'm laughing about her books waving to her. Bless her heart! Any chance that when the permanent teeth come in it will correct on its own? I knew baby teeth have roots, the roots usually dissolve over time and with the aid of the adult tooth pushing on it, it will come out. Awww poor little peanut, that sounds ever so painful! Hoping for lots of yummy soup recipes for you to help ease the pain of eating! Yup, I knew they had roots. My kids have each lost some teeth complete with roots. 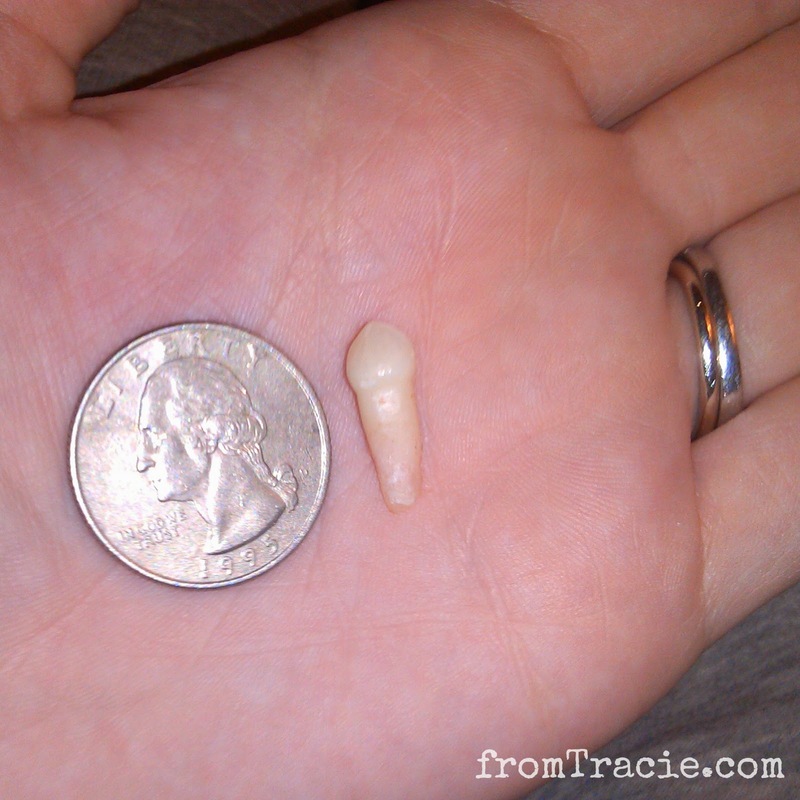 I was traumatized years ago when my doctor pulled out a baby tooth of my sons and the root was there. it was disgusting and painful. That is so interesting! I guess I never even considered if they did or didn't have roots. #KnowledgeIsPower! Yikes. Those are some very deep-rooted teeth. No wonder the first one was so painful for her! My ten year-old still has four baby teeth and he is about to get braces. Here's hoping they don't have to get pulled! I learned that baby teeth have roots about 2 years ago when my daughter had a a dental accident.Poor Katarina! I hope everything goes well with the surgery and braces! Oh my. How brave she is. I do hope this works out great for her. Those roots are bigger than I thought. Amazing. I had no idea. I hope all is well. The Poor Thing I never Knew About The Roots Very Interesting Thank You For Sharing! I didn't realize that baby teeth can have such long roots either! What a brave girl she was! Very true, sadly even in big cities. very few Dental Officies offer sedation, and sometimes those who need their services have to suffer months before they can get the appointment because those offices are such a limited resource. Your DD was super brave,and I hope the 'tooth fairy' is going to do something extra special, maybe a special amusement park outing? Eww..teeth gross me out! This is sorta cool though..lesson learned. Thanks! my friend just told me her daughter, a teenager just had 6 teeth extracted for this very reason. I have to take my son in for some extensive work soon, and he'll need full sedation. I can't say I'm not really scared about it. And I had no idea baby teeth had roots! Mine must have some, because I'm 40 and still have baby teeth! My daughter had to have 3 teeth pulled because they weren't ever coming out on their own either! Wow!! I had no idea! This is such a great post. I hope your daughter is feeling better. I'm sure it was a tough transition for her. Wow, those are some impressive teeth. Hope your daughter's doing okay. Going to the dentist is always scary. Treat her to lots of ice cream! You're not kidding about those roots. Those babies were not intending to leave at all, were they? I'm glad the procedure is over now and you're moving on to the next step! Wow! Those are big teeth! I needed several of mine removed for my braces - but they were all adult teeth. Poor kiddo - she'll have a beautiful smile afterward though! This was a no good very bad day if I have ever seen one before. Oy. Awww brave girl! Hope she is feeling better soon! My son had to have some baby teeth pulled recently and I thought they looked so strange with the roots still attached. He's had dental surgery twice. The first time he had a general anesthetic and he had a hard time coming out of it. He was screaming and terrified even though I was holding him in the recovery room. Thankfully we didn't have to go through that the second time as we were able to have the procedure done in office with a local anesthetic. Here's to a speedy recovery for Kat! Wow. I would hate to have to go through that....you have a very brave little girl! Hopefully the worst is behind her.